It was a mixed week for US equity indexes, with net weekly changes ranging from +0.3% (Nasdaq comp'), -0.3% (sp'500), -1.0% (R2K), to -2.0% (Transports). The mid term outlook offers upside across the summer. The next realistic chance for even a 5% retrace appears late Sept/Oct. 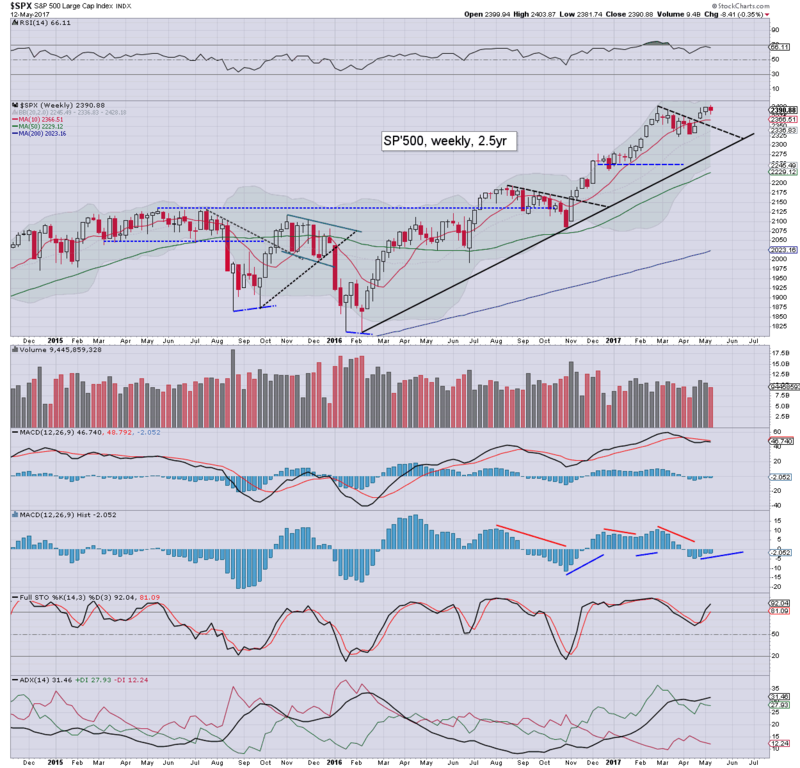 The year end target of sp'2683 remains on track. 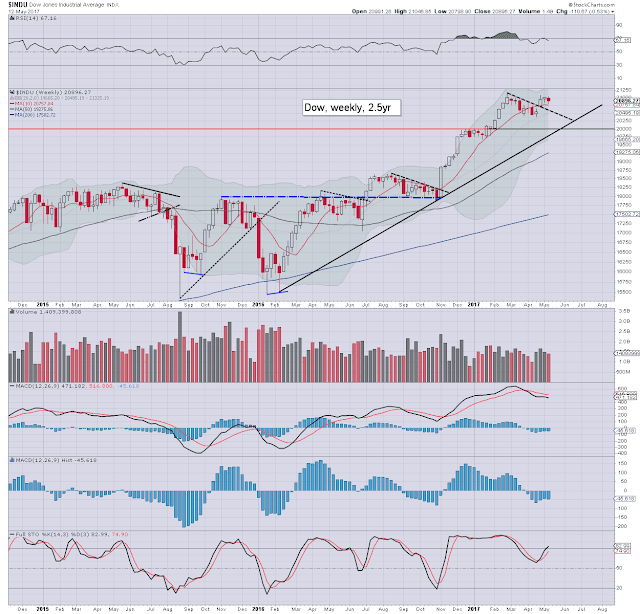 A net weekly decline of -8pts (0.3%), settling at 2390. There was a notable new historic high of 2403. Underlying MACD (blue bar histogram) remains moderately negative, but is threatening a bullish cross before end month. 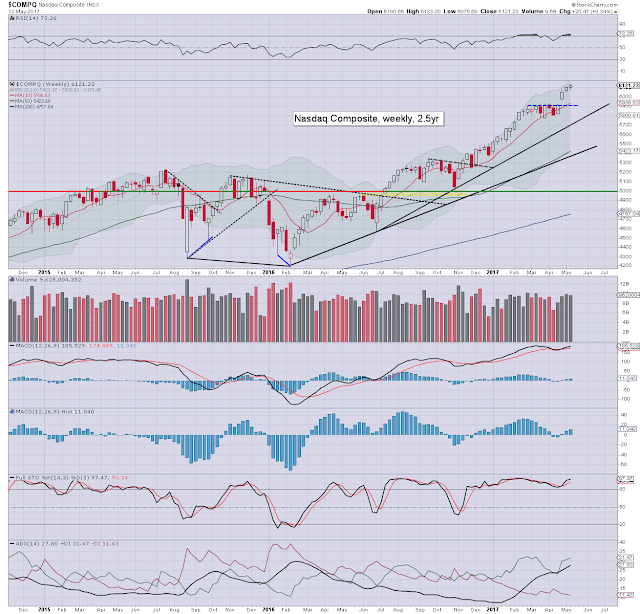 Core rising trend is in the 2280s, and is rising around 20/25pts a month. 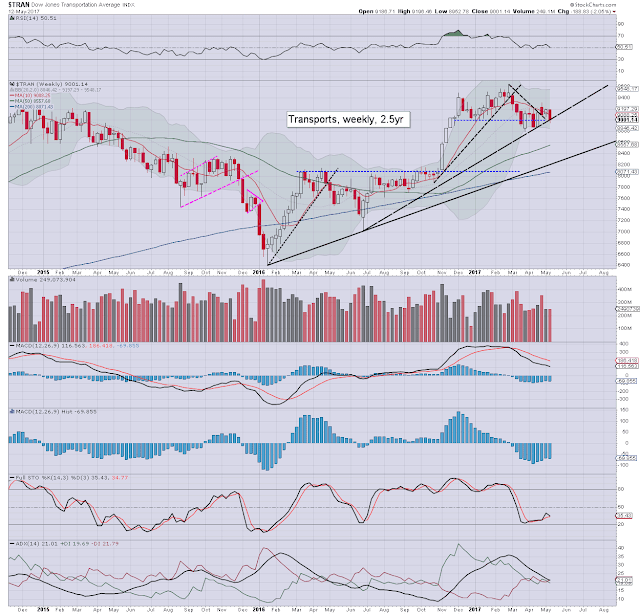 Best guess: near term upside into mid/late June, at least to the 2420/30s. The 2500s appear viable by late September. No retrace >7% seems likely this year. The year end target of 2683 appears on track. Equity bears have nothing to tout unless a break of the monthly 10MA - currently at 2268, and which is rising 20/25pts a month. The tech sector continues to lead the way, with a net weekly gain of 0.3%, settling at 6121. There was a notable new historic high of 6133. First soft support are the 5900s, whilst the 6200s seem a valid target for June, when the fed are set to raise rates for a second time this year. It remains rather bizarre how very few are talking about the 7000s, which are very much a valid target, whether by year end.. or early 2018. The mighty Dow declined -110pts (0.5%) to 20896. Its notable the Dow came within just 23pts of the Feb' high of 21169. Underlying MACD remains negative, and there is plenty of potential for a grander run to around 23k by year end. Its highly notable that the giant psy' level of 20k is now first big support. If 20k is broken under at any point from June onward, it would not just be a break of an important support/psy' level, but also the rising trend from early 2016, along with the very important monthly 10MA. The master index saw a moderate net weekly decline of -0.6%, settling at 11547. Upper bollinger is currently offering the 11700s. The 12000s look a stretch before July. 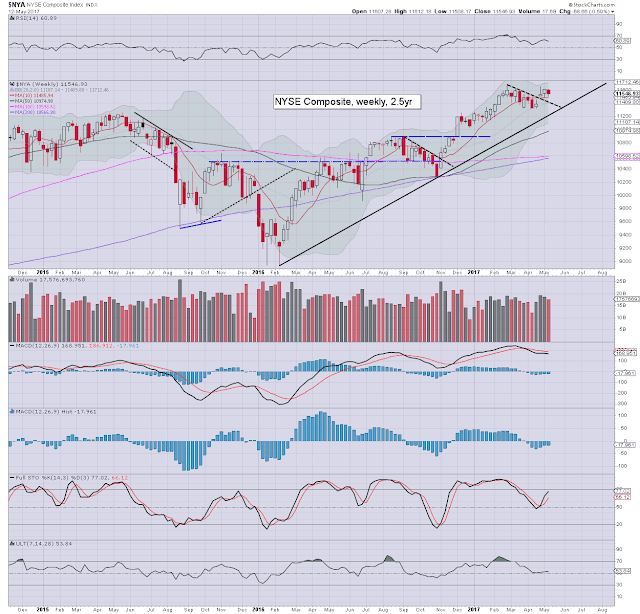 Rising trend - from the early 2016 lows, will be in the 11700s in August. It should be important to the equity bulls to keep pushing.. with no retraces bigger than 5%. 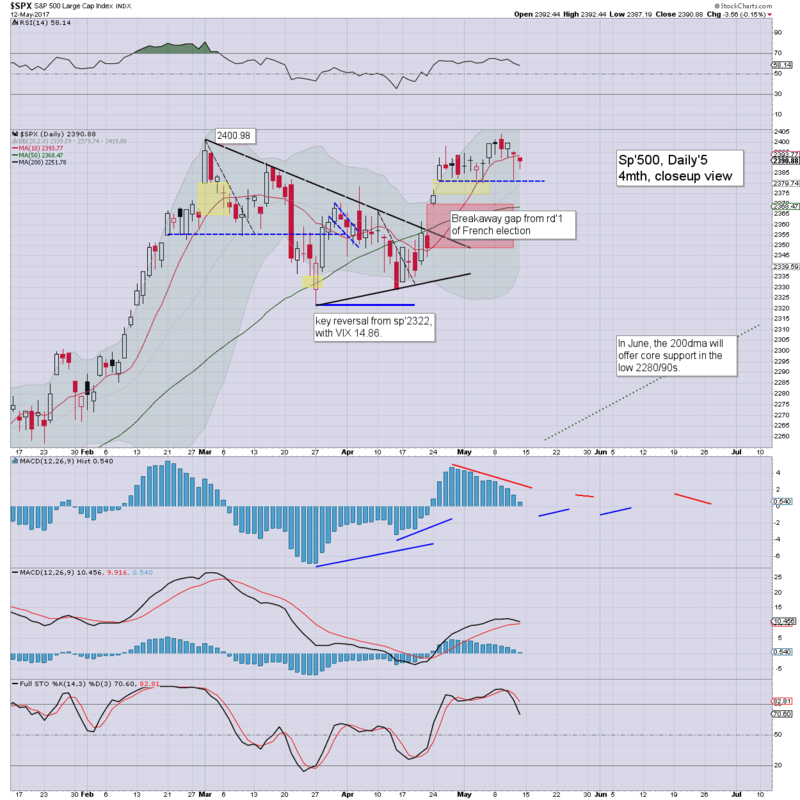 The second market leader - R2K, declined for a second consecutive week, settling lower by a significant -1.0% to 1382, but still above the key 10MA. Renewed upside into the 1400s remains highly probable, with the 1500s a viable target for late summer. 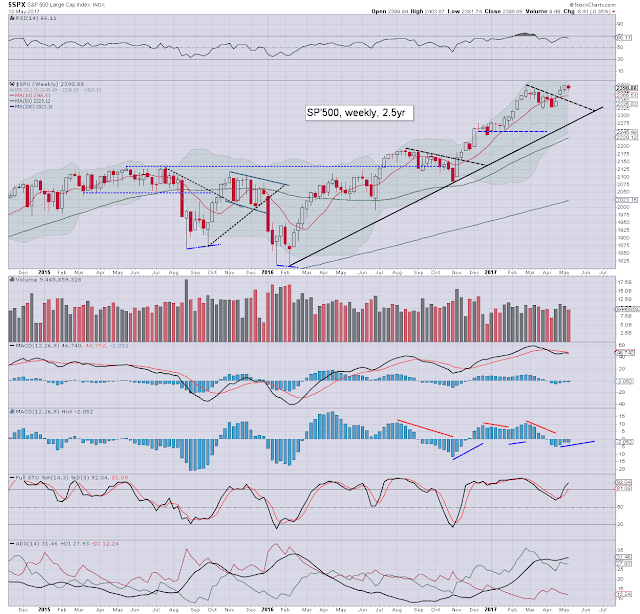 Cyclically, the R2K is on the lower end, and the threat is indeed of upside, rather than a break of core rising trend. 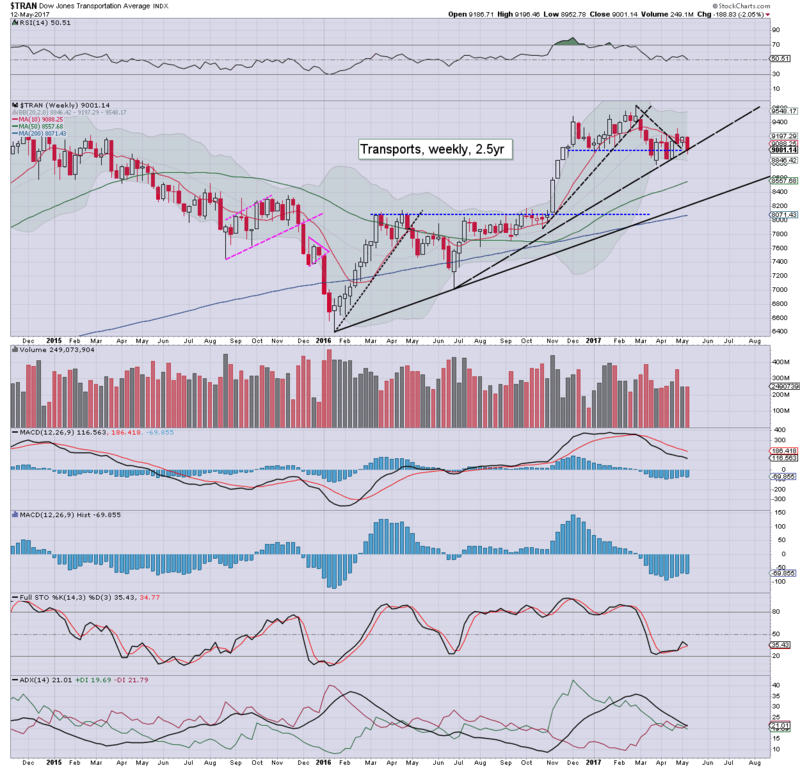 The 'old leader' - Transports continues to lag, with a net weekly decline of a significant -2.0% to 9001. Underlying MACD remains very negative, and is showing little sign of a decisive turn back upward. Things would turn very bearish with a break under 8k, but that is a clear 1000pts (11%) lower. All US equity indexes remain within their mid term upward trends that extend back to early 2016. 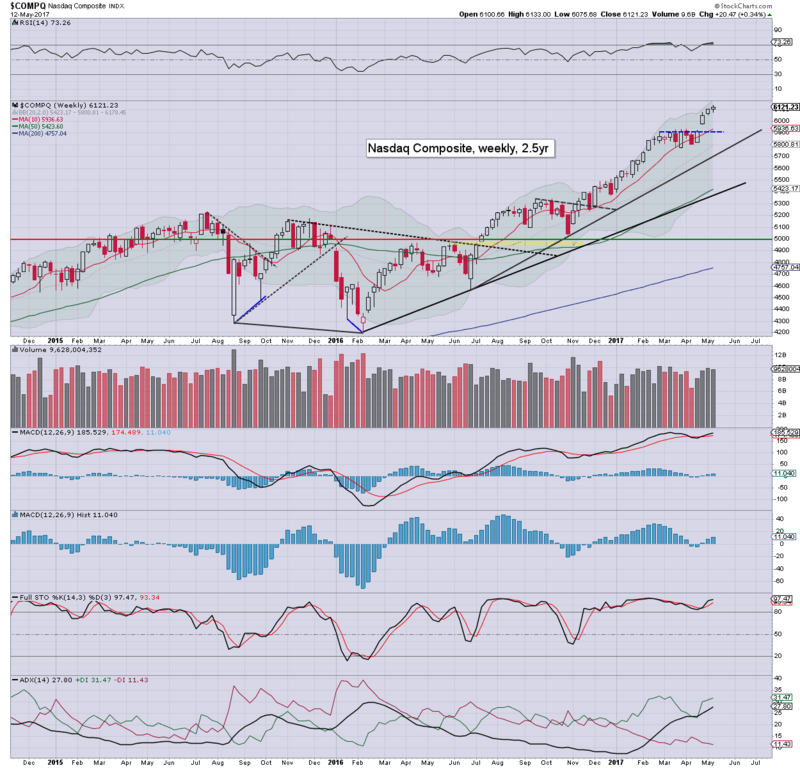 The Nasdaq continues to lead the way upward, with the Transports remaining the market laggard. Underlying price action is powerfully strong, with most retraces being only of a moderate degree. Most indexes have around 5% of downside buffer before core rising trend is tested. It will likely be a very quiet week, as Q1 earnings have largely concluded. There isn't much econ-data due, and it will give Mr Market the opportunity to pause. That does bode for further price chop, but leaning on the bullish side. *there are just two fed officials scheduled, notably Bullard, early Friday. If you want the most balanced market commentary and outlooks, then subscribe. Or you could buy around two shares of SNAP each month... by late summer. US equity indexes closed moderately weak, sp -3pts at 2390. The two leaders - Trans/R2K, settled lower by -0.4% and -0.5% respectively. 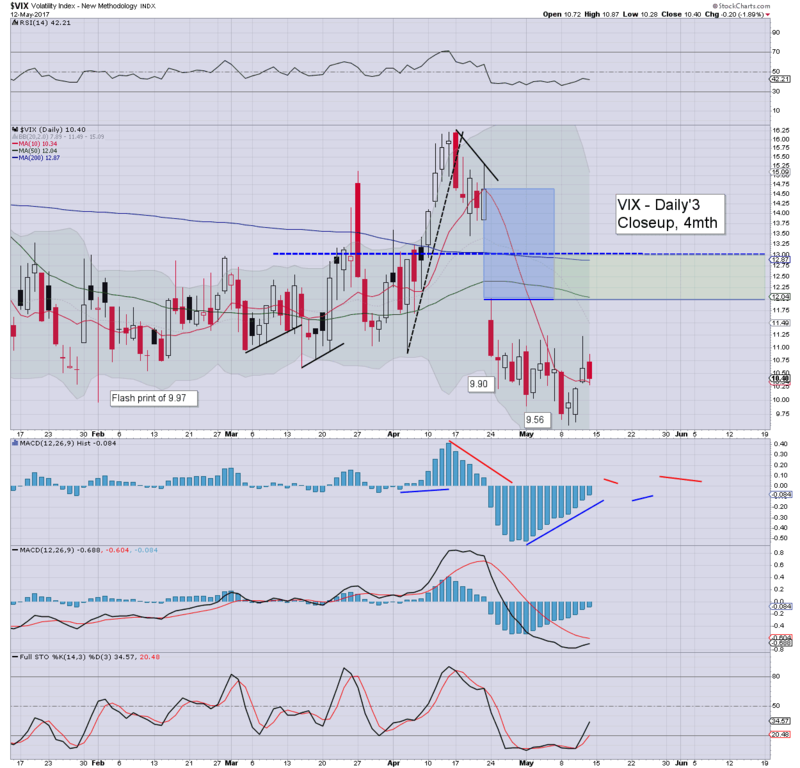 VIX settled -1.9% at 10.40. 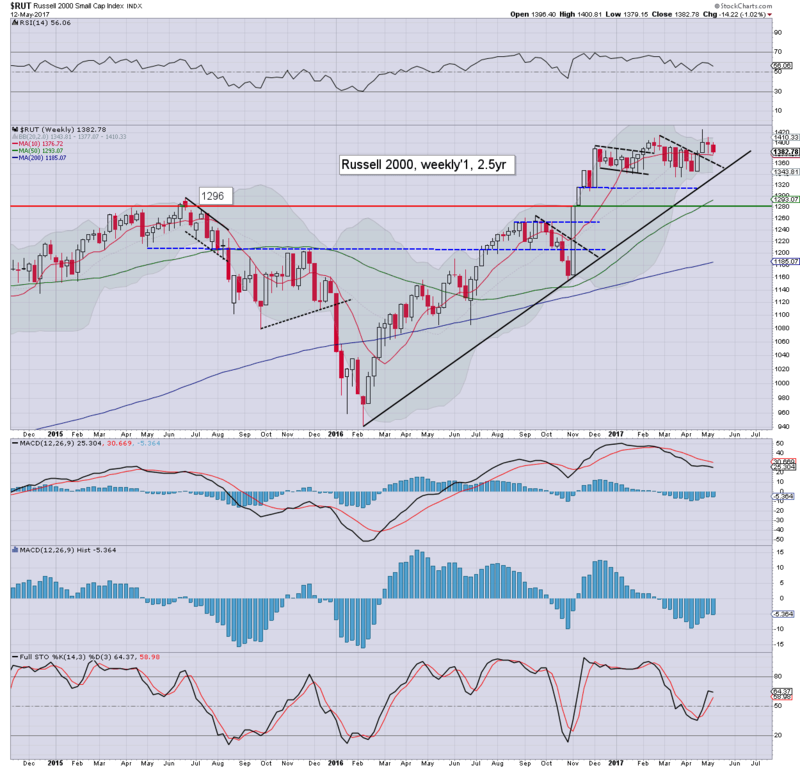 Near term outlook offers renewed upside into the 2410/20s before end month. 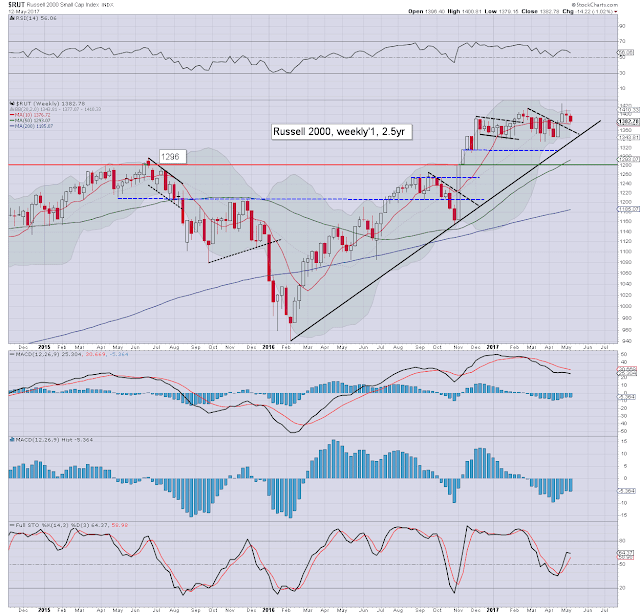 Broadly, the 2500s are a valid target by late Sept'. The week ended with an entire day of very minor chop, a trading range of just 5pts (0.2%). 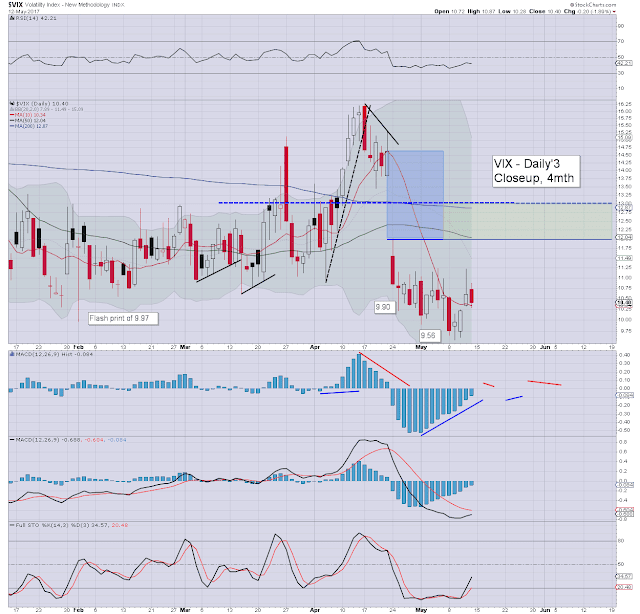 Market volatility remains very subdued, with the VIX naturally being knocked a little bit lower into the weekend. With new historic highs (if fractional) in the Nasdaq comp' (6133) and the sp'500 (2403), it was a bullish week, but more on that tomorrow. Q/A from Najarian, aka. Dr J. 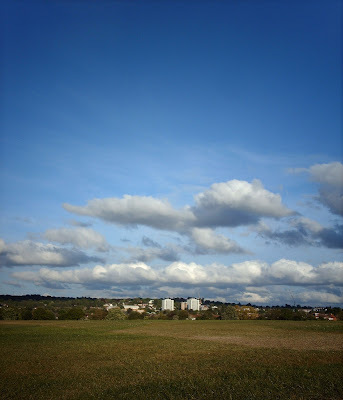 A reasonable day... between some sharp showers. Bullish!